Background and objectives Poor cognition can affect educational attainment, but the extent of neurocognitive impairment in children with CKD is not well understood. This systematic review assessed global and domain-specific cognition and academic skills in children with CKD and whether these outcomes varied with CKD stage. Design, setting, participants, & measurements Electronic databases were searched for observational studies of children with CKD ages 21 years old or younger that assessed neurocognitive or educational outcomes. Risk of bias was assessed using a modified Newcastle–Ottawa scale. We used random effects models and expressed the estimates as mean differences with 95% confidence intervals stratified by CKD stage. Results Thirty-four studies (25 cross-sectional, n=2095; nine cohort, n=991) were included. The overall risk of bias was high because of selection and measurement biases. The global cognition (full-scale intelligence quotient) of children with CKD was classified as low average. Compared with the general population, the mean differences (95% confidence intervals) in full-scale intelligence quotient were −10.5 (95% confidence interval, −13.2 to −7.72; all CKD stages, n=758), −9.39 (95% confidence interval, −12.6 to −6.18; mild to moderate stage CKD, n=582), −16.2 (95% confidence interval, −33.2 to 0.86; dialysis, n=23), and −11.2 (95% confidence interval, −17.8 to −4.50; transplant, n=153). Direct comparisons showed that children with mild to moderate stage CKD and kidney transplants scored 11.2 (95% confidence interval, 2.98 to 19.4) and 10.1 (95% confidence interval, −1.81 to 22.0) full-scale intelligence quotient points higher than children on dialysis. Children with CKD also had lower scores than the general population in executive function and memory (verbal and visual) domains. Compared with children without CKD, the mean differences in academic skills (n=518) ranged from −15.7 to −1.22 for mathematics, from −9.04 to −0.17 for reading, and from −14.2 to 2.53 for spelling. Conclusions Children with CKD may have low-average cognition compared with the general population, with mild deficits observed across academic skills, executive function, and visual and verbal memory. Limited evidence suggests that children on dialysis may be at greatest risk compared with children with mild to moderate stage CKD and transplant recipients. CKD has known detrimental effects on children’s physical health and wellbeing, and there is increasing awareness of its potential effect on neurocognitive function, academic outcomes, and mental health (1–3). The pathophysiologic effects of advanced uremia and anemia seen in CKD may alter brain metabolism and impair neurocognitive function through changes to neuronal myelination and synaptic development (4). CKD treatment regimens can also disrupt school attendance and compromise academic achievement, with potential consequences for educational and vocational attainment as children transition to adulthood (4,5). In children and adolescents with CKD, evidence regarding the effect of reduced kidney function on neurocognitive function varies substantially across studies. A number of studies have identified lower nonverbal intelligence quotient (IQ) and motor performance in children with kidney disease compared with healthy age-matched controls (6–11). Some have found no significant differences in memory (verbal and nonverbal) between children with and without CKD (11). Others have reported specific deficits in complex auditory attention, verbal working memory, and the recognition of emotional states (11,12). The extent and patterns of neurocognitive and academic impairment in children may also vary by CKD stage. The overall IQ score for children treated with hemodialysis seems to be lower than that of children with moderate stage CKD and those with kidney transplants (13–15). Nonetheless, several studies have found improvement in IQ, attention, and mental processing speed after transplantation (16,17). The objectives of this systematic review were to assess global and domain-specific neurocognitive function and academic skills in children with CKD and whether these outcomes worsen with advancing CKD stage. We conducted a systematic review of observational studies on the basis of standard methods and reporting criteria in the Meta-Analysis of Observational Studies in Epidemiology guidelines (18). The protocol was registered with the International Prospective Register of Systematic Reviews (CRD42014013056). Studies were included if they assessed neurocognitive or academic outcomes in children and adolescents (ages <21 years old) with CKD. We included studies where comparisons were made between patients with CKD and patients without CKD, either indirectly using normative population data or directly using matched non-CKD cohorts and/or between different stages of CKD (mild to moderate stage CKD, dialysis, and transplant). Prospective cohort and cross-sectional designs were eligible. MEDLINE, Embase, and PsycINFO were searched from database inception to December 2016, with no language restrictions (Supplemental Table 1). We also hand searched the reference lists of identified studies and review articles. Two authors (K.C. and A.v.Z.) screened the titles and abstracts, and they independently assessed the full-text articles to identify studies that satisfied the inclusion criteria. A third reviewer (G.W.) adjudicated where disagreement arose. Data extraction was carried out using standard extraction forms. Studies reported in non-English languages were translated before assessment. Where more than one publication of a study existed, only the publication with the most complete data was included for meta-analysis. We sought data on the age, socioeconomic status, duration of CKD of study participants, and raw scores from cognitive testing from study authors and reported these findings where available. Two authors (K.C. and M.D.) undertook independent quality assessment of the included studies. We used a modified Newcastle–Ottawa scale to assess risk of bias. Differences were resolved by discussion until consensus was achieved. We summarized the overall and domain-specific neurocognitive and academic estimates between those with and without CKD using random effects models stratified by CKD stage (mild to moderate stage CKD, dialysis, and transplant), with the summary estimates expressed as mean differences with 95% confidence intervals (95% CIs) and effect sizes reported as Cohen d values. We compared estimates against the population norm for standardized measures of intelligence (Wechsler scales: mean =100, SD=15; IQ classification: 80–89 low average, 90–109 average, and 110–119 high average ), academic achievement (Wechsler Individual Achievement Test [WIAT] and Wide Range Achievement Test [WRAT]), attention (Conners Continuous Performance Test [CPT]), executive function (Behavior Rating Inventory of Executive Function [BRIEF]), and memory (Wide Range Assessment of Memory and Learning [WRAML]). Where possible, comparisons were also made between children with CKD and age-matched controls. Unless specified, a lower score was indicative of poorer outcomes. We also compared the overall and domain-specific cognitive and academic estimates between CKD stages if data were available. Heterogeneity was assessed using the Cochran Q test and the I2 statistic. Possible sources of heterogeneity were investigated using subgroup analysis and metaregression (random effects model) on publication year, country of publication, study design, study size, and risk of bias. Meta-regression was conducted where ten or more studies for the specified outcomes were available. Funnel plots were generated to assess publication bias. All analyses were conducted using Review Manager Version 5 and Comprehensive Meta-Analysis Version 3. Of 7437 records identified, 34 studies (25 cross-sectional and nine cohort) with 3086 children and adolescents were included, and findings from 18 studies were used in the meta-analyses (Figure 1). The studies were conducted in nine countries, including the United States (59%), The Netherlands (9%), Canada (6%), Egypt (6%), and Finland (6%). Of those with CKD (n=2446), 2092 (85.5%) had mild to moderate stage CKD, 115 (4.7%) were on dialysis, and 239 (9.8%) had kidney transplants. Neurocognitive function was measured by 51 different tests, with full-scale IQ being the most frequently reported outcome followed by verbal and performance IQ, memory, attention, and executive function (Figure 2 A–C, Supplemental Tables 2 and 3, Table 1). Preferred reporting items for systematic reviews and meta-analyses flowchart. Thirty-four studies were included for systematic review (25 cross-sectional, 9 cohort). IQ, intelligence quotient. Significant deficits observed in children with CKD. A shows full-scale intelligence quotient (IQ) between children with and without CKD. B shows verbal and performance IQ between children with and without CKD. 95% CI, 95% confidence interval; df, degree of freedom; IV, inverse variance; SE, SEM. The overall risk of bias was high (Figure 3). Seventeen (50%) studies described the recruitment strategies, and only nine (26%) had participation rates of >70%. Twenty-three (68%) studies did not report an objective assessment of the exposure (CKD) with blinding to outcome. Conduct of statistical methods was adequate in 21 (62%) studies. Adjustment for confounders was conducted in 20 (59%) studies. Asymmetry of funnel plots also indicated potential publication bias for studies conducted with different CKD groups (Supplemental Table 4). Risk of bias assessment. The overall risk of bias was high. Intelligence (25 Studies, 1446 Patients). The Wechsler scales were the most frequently used instruments (n=22 studies) for assessing intellectual functioning (20). The mean global intelligence (full-scale IQ) of all children with CKD was 92.7 (SD=16.2; n=758). Children with mild to moderate stage CKD scored −9.39 (95% CI, −12.6 to −6.18), −8.07 (95% CI, −12.2 to −3.90), and −8.73 (95% CI, −12.8 to −4.69) points on full-scale IQ, verbal IQ, and performance IQ, respectively, compared with the general population. The full-scale IQ, verbal IQ, and performance IQ scores were −16.2 (95% CI, −33.2 to 0.86), −14.1 (95% CI, −33.2 to 4.89), and −15.5 (95% CI, −37.3 to 6.21) points for children on dialysis compared with the general population, respectively. Transplant recipients scored −11.2 (95% CI, −17.8 to −4.50), −4.06 (95% CI, −11.1 to 3.03), and −10.5 (95% CI, −16.8 to −4.13) points on full-scale IQ, verbal IQ, and performance IQ, respectively, compared with the population norm. For studies that included age-matched controls, children with mild to moderate stage CKD scored −16.2 (95% CI, −22.2 to −10.1), −7.84 (95% CI, −13.5 to −2.20), and −11.7 (95% CI, −13.2 to −10.2) points on full-scale IQ, verbal IQ, and performance IQ, respectively, compared children without kidney disease. Children on dialysis scored −29.5 (95% CI, −38.5 to −20.5), −18.2 (95% CI, −23.2 to −13.2), and −21.1 (95% CI, −29.2 to −13.0) points on full-scale IQ, verbal IQ, and performance IQ, respectively, compared with age-matched controls. The full-scale IQ for transplant recipients was −29.4 (95% CI, −53.9 to −4.77) points compared with age-matched controls. Five studies (n=168) compared intellectual functioning across CKD stage. 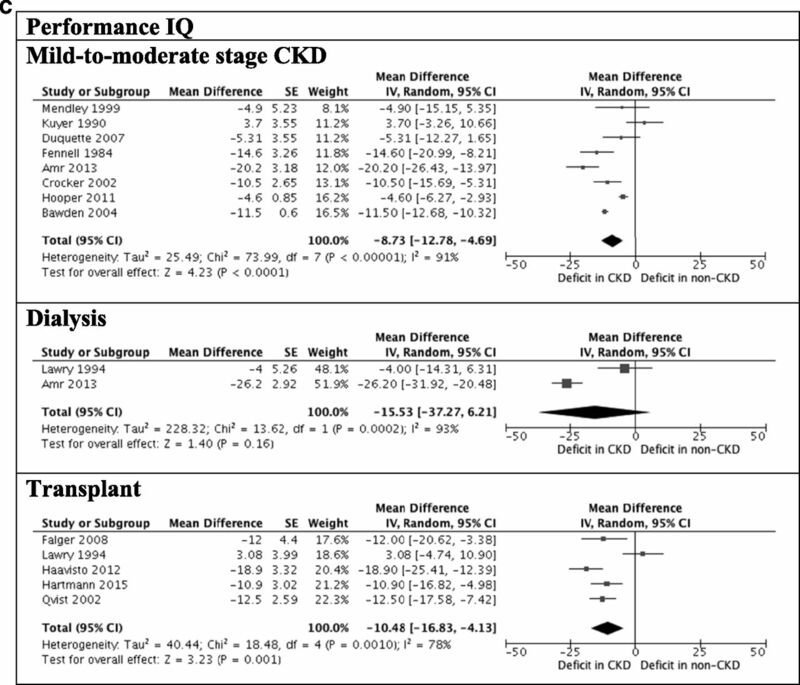 Compared with children on dialysis, the average full-scale IQ score was 11.2 points higher among children with mild to moderate stage CKD (95% CI, 2.98 to 19.4). There may be improvement after transplantation, because transplant recipients scored 10.1 (95% CI, −1.81 to 22.0) points higher in full-scale IQ than children on dialysis. Attention (13 Studies, 1366 Patients). The Conners' CPT (five studies; n=875) was the most frequently used instrument to assess attention, with higher T scores (mean =50; SD=10) reflecting greater impairment (21,22). Children with CKD had equivalent scores to the population norms for variability (0.10; 95% CI, −1.02 to 1.22), but scores were 1.70 (95% CI, 0.32 to 3.08) and 1.70 (95% CI, 0.58 to 2.82) points higher in the omission and commission errors subtests, respectively, and −1.80 (95% CI, −3.39 to −0.21) points in reaction time. Five studies used the BRIEF, which assesses executive function using T scores (mean =50; SD=10), where higher T scores indicate greater impairment (23). Compared with the general population, children with mild to moderate stage CKD scored 3.50 (95% CI, 1.97 to 5.03), 5.90 (95% CI, 4.34 to 7.46), and 5.20 (95% CI, 3.64 to 6.76) points higher in the behavior regulation, metacognition, and global executive indices of the BRIEF, respectively. This pattern of deficit was less consistent among transplant recipients, who scored −1.70 (95% CI, −5.88 to 2.48) points compared with the general population in behavior regulation but 11.4 (95% CI, 0.75 to 22.1) and 5.80 (95% CI, −2.11 to 13.7) points higher in the metacognition and global executive indices, respectively. The WRAML was used to assess three domains of memory (verbal memory, visual memory, and acquisition of new learning) in five studies (mean =10; SD=3). Compared with children without CKD, those with mild to moderate stage CKD scored lower in the subtests of verbal memory (story memory, sentence memory, and number/letter) and visual memory (picture memory, design memory, and finger windows). Transplant recipients scored −11.2 (95% CI, −18.4 to −4.01), −11.3 (95% CI, −17.1 to −5.55), and −13.4 (95% CI, −19.5 to −7.26) points in verbal, visual and screening memory, respectively, compared with the general population. The WIAT and the WRAT were used to measure academic skills (mean =100; SD=15), with outcomes commonly reported as reading, mathematics, and spelling (Supplemental Table 2) (24–26). Overall, the scores for children with mild to moderate stage CKD were −5.19 (95% CI, −8.14 to −2.25), −1.50 (95% CI, −2.56 to −0.43), −9.58 (95% CI, −16.0 to 3.12), and −5.18 (95% CI, −8.28 to −2.09) points in reading accuracy, reading comprehension, mathematics, and spelling, respectively, compared with the general population (Supplemental Figure 1). Transplant recipients scored −9.31 (95% CI, −16.7 to −1.90), −12.0 (95% CI, −13.0 to −11.1), and −9.20 (95% CI, −11.2 to −7.25) points on reading accuracy, mathematics, and spelling compared with the general population. The greatest differences were seen in children on dialysis, who scored −10.0 (95% CI, −11.5 to −8.46), −11.0 (95% CI, −12.5 to −9.46), and −15.0 (95% CI, −16.5 to −13.5) points on reading, arithmetic, and spelling, respectively, compared with the population norm. In studies with healthy age-matched controls, children with mild to moderate stage CKD scored −0.60 (95% CI, −8.44 to 7.24) and −7.25 (95% CI, −8.89 to −5.62) points in reading accuracy and mathematics, respectively, but 0.40 (95% CI, −1.42 to 2.22) and 4.76 (95% CI, −0.52 to 10.0) points higher in reading comprehension and spelling, respectively. For children on dialysis, reading, arithmetic, and spelling scores were lower by −10.0 (95% CI, −11.9 to −8.08), −3.00 (95% CI, −4.92 to −1.08), and −11.0 (95% CI, −12.5 to −9.46) points, respectively, compared with the age-matched controls. Transplant recipients scored −7.00 (95% CI, −8.39 to −5.61), −10.0 (95% CI, −11.4 to −8.61), and −7.00 (95% CI, −8.39 to −5.61) points on reading, arithmetic, and spelling, respectively, compared with age-matched controls. Compared with patients on dialysis, transplant recipients generally had higher scores on reading, arithmetic, and spelling. Four studies considered the effect of variables, such disease severity, duration of CKD, and age of disease onset, on intellectual functioning and academic achievement in children across different CKD stages. Compared with children with mild to moderate stage CKD, those with advanced stage CKD had lower full-scale IQ and memory function. Children with prolonged duration of reduced kidney function seemed to have lower memory function and academic skills compared with children who experienced shorter duration of CKD. However, the age of disease onset did not seem to have an effect on the neurocognitive function in children with CKD. With the exception of study sample size, the full-scale IQ scores did not significantly vary with our hypothesized study-level sources of variability (Figure 4). The mean differences in full-scale IQ scores between children with CKD and the general population in studies published before and after 2010 were −10.4 (95% CI, −12.5 to −8.31) and −9.57 (95% CI, −17.2 to −1.98), respectively. The estimates for cross-sectional and cohort studies were −9.37 (95% CI, −13.4 to −5.34) and −9.56 (95% CI, −14.1 to −5.02), respectively. For studies with a smaller sample size (n≤50), the mean difference was −11.7 (95% CI, −12.9 to −10.4) compared with −6.77 (95% CI, −12.4 to −1.10) for studies with larger sample sizes (n>50). 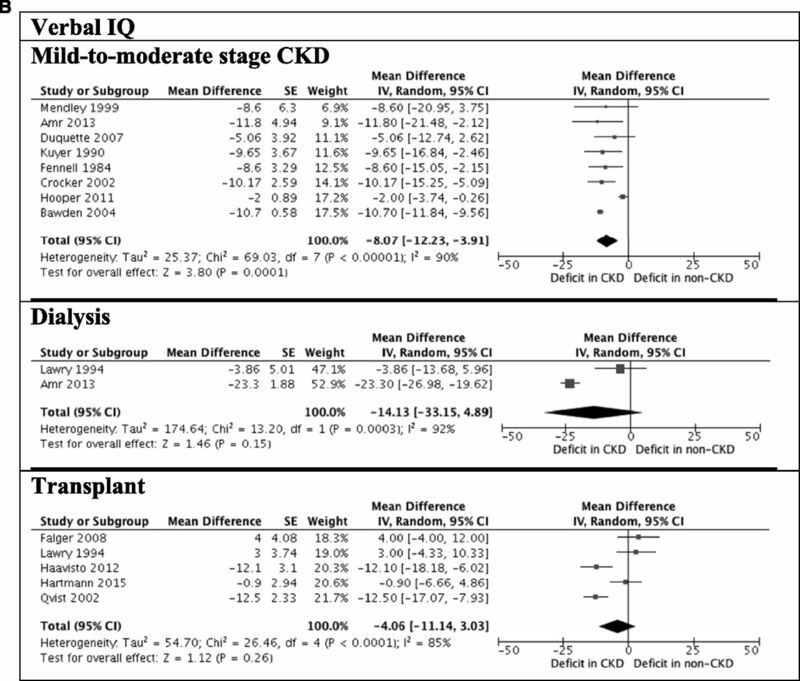 Subgroup analyses of full-scale intelligence quotient in children with and without CKD (mild to moderate stage CKD). 95% CI, 95% confidence interval; df, degree of freedom; IV, inverse variance; SE, SEM. A metaregression (n=11 studies) of full-scale IQ scores between children with and without CKD showed that study sample size was the only variable that explained the high degree of heterogeneity between studies (β=5.31; SEM=2.01; P<0.01). The coefficients in full-scale IQ scores between children with CKD and the general population were −0.51 (SEM=3.01; P=0.86), 0.05 (SEM=3.67; P=0.99), 2.58 (SEM=2.51; P=0.30), and −0.72 (SEM=3.41; P=0.83) for year of publication (before and after 2010), study designs (cross-sectional versus cohort studies), country (the United States versus not the United States), and study quality (low versus high risk of bias), respectively. Our study findings suggest that children with CKD may have lower intellectual functioning compared with children without CKD. Deficits were most apparent in global intelligence, with children achieving average to low-average full-scale IQ scores compared with the population norm. Compared with children with mild to moderate stage CKD and those with kidney transplants, children on dialysis had the lowest full-scale IQ scores. The specific patterns of deficit were evident for attention, memory, and executive function domains. For attention, children with CKD had difficulty in holding information and shifting from one stimulus to another but displayed intact function in other areas. Children with CKD had reduced visual and verbal memory compared with children without CKD. For executive function, children with CKD had reduced metacognitive skills but preserved behavioral regulation compared with children without CKD. Similar to scores of intellectual functioning, academic achievement also ranged from average to low average among children with CKD compared with the general population, with the greatest deficit observed in mathematics. Clinically, scores at least one SD lower in overall intelligence and domain-specific cognitive domains place children at increased risk of poor academic performance at school, reduced quality of life, and poor mental health, with potential implications for vocational attainment and financial independence as they transition into adulthood (3,27,28). We found at least one-SD lower intellectual functioning (full-scale IQ and performance IQ), academic achievement (total achievement subdomain), and executive function (initiation, sustaining, and BRIEF metacognition index subtests) among children with CKD compared with those without CKD. Because the SEM of measurement is approximately five standard points for Wechsler scales and our findings show differences of more than five standard points, such cognitive deficits would be considered clinically meaningful (29). There are also data suggesting that children with more advanced stage CKD, increased duration of disease, and younger age of disease onset are associated with an increased risk of neurocognitive deficit and poor academic outcomes (15,28). By comparison, studies of children with epilepsy also show deficits in intellectual functioning: full-scale IQ mean =85.0 (SD=20.7; n=69), verbal IQ mean =86.9 (SD=22.6; n=69), and performance IQ mean =84.5 (SD=19.4; n=69) (30). Prior studies have reported that children with chronic illnesses, such as chronic liver disease (CLD), experienced comparable deficit in intellectual functioning, attention, and executive function, but a significant improvement in IQ scores was observed in children with CLD after transplantation (full-scale IQ mean =94.7; SD=13.5; effect size =−0.35; n=134) (31,32). Such deficit in cognitive function may be associated with poorer academic achievement, health literacy, and psychologic wellbeing in children with CLD (33–35). Unique metabolic, biochemical, and neurodegenerative mechanisms may partially explain why the overall intellectual function of children with CKD is reduced compared with the general population. Increased plasma levels of uremic solutes may cause neurotoxic demyelination and impair synaptic development (4). CKD-related anemia and poor nutrition may also reduce the delivery of oxygen to the brain and alter brain metabolism, whereas secondary hyperparathyroidism can potentially interfere with neurotransmission by increasing calcium levels in the brain (36). It has been proposed that dialysis itself may also lead to cognitive impairment through rapid changes in BP causing brain hypoperfusion as well as the presence of gaseous microemboli, edema, and ongoing deposition of hemosiderin in cerebral parenchyma (37). These intradialytic BP changes in addition to the increased severity and chronicity of pathophysiologic effects related to ESKD, such as hypertension and poor nutrition, may result in reduced cognitive function among children on dialysis compared with those with other CKD stages. Alongside inherent pathophysiologic factors, the therapeutic regimens for CKD may also compromise academic achievement (2,3). First, the frequency of sleep disturbances in children with CKD may result in poor concentration, excessive daytime sleepiness, and lower academic performance (38). Second, the interactions of complex medication routines and strict dialysis cycles may decrease attentional control, working memory, and executive function, cognitive domains that are important to children’s ability to acquire, understand, and retain information in social and educational environments (37,39,40). In particular, lower mathematic scores may be attributed to the reduced overall neurocognitive function of children with CKD, with fluid reasoning and processing speed having direct and indirect effects on mathematic ability (41,42). Studies examining the relationship between intelligence (full-scale IQ) and academic performance reported a moderate and statistically significant correlation moderated by factors, such as attendance, motivation, home and school environments, and cultural demographics (3,43). Across all CKD stages, we have shown that intelligence is largely consistent with academic skills. Third, ongoing dialysis sessions and recovery from transplant surgeries may reduce the amount and regularity of time spent in the classroom, with chronic absenteeism potentially preceding loss of interest, withdrawal, and poor school progression (2,44,45). Importantly, low-average cognition and academic skills suggest that children receiving dialysis may be at greatest risk compared with those in other CKD groups. Therefore, educational support programs should aim to minimize deficits in attention, memory, and executive function and navigate the logistic restrictions of rigorous management regimens for CKD through a multidisciplinary approach. Identification of the biopsychosocial factors associated with improved neurocognitive and educational outcomes and the involvement of relevant expert teams may inform the development of a comprehensive post-transplant rehabilitation service for children and adolescents with CKD. 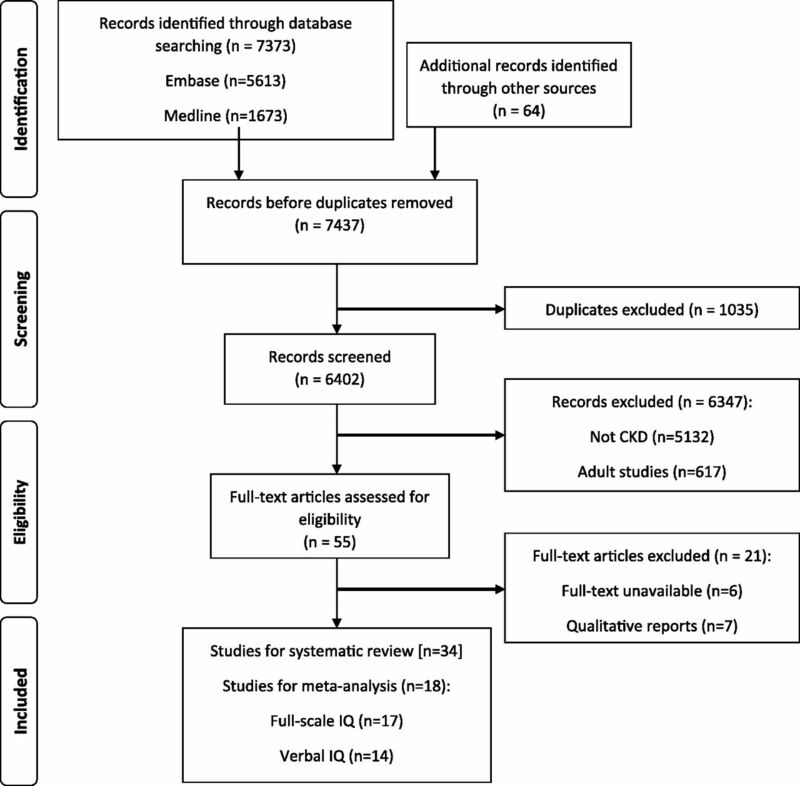 This systematic review synthesizes all published evidence on global and domain-specific cognitive and academic outcomes in children and adolescents with CKD, including variation across CKD stage. Our findings provide relevant prognostic information on how advancing CKD stage may affect neurocognitive and academic outcomes, while exploring the effect of publication year, study size, and study design on these outcomes. Nonetheless, there are some potential limitations. We combined all studies of intelligence (IQ) that used the Wechsler scales. However, the composition of IQ has evolved over time, with newer versions of Wechsler Intelligence Scale for Children focusing more on fluid reasoning than crystallized knowledge (46–48). Because of the variability in exposure groups, outcome measures, and reporting, meta-analyses of estimates for outcomes including attention, executive function, and memory were not possible. Although heterogeneity was partially explained by study size, not all of the sources of variability could be identified. Small sample sizes may have insufficient power and thus, reduce the likelihood that a statistically significant result reflects a true effect. Nonetheless, additional factors to consider for the unexplained heterogeneity include participant demographics, such as age, socioeconomic status, severity of CKD, duration of disease, and age of onset; study-level factors, such as use of direct controls (versus normative population data); and the breadth of outcome measures used. Data on CKD-related clinical factors, such as low birth weight, hypertension, and nutritional status, were also not available from included studies. As such, we could not assess the potential confounding effects of these factors on the association between reduced kidney function and cognition in our analyses. Lastly, because the majority of studies have cross-sectional designs, we could not assess the longitudinal change in cognitive function with advancing CKD stage. Our findings suggest that children with CKD may have low-average neurocognitive and academic outcomes. Although cognition seems to worsen with advancing CKD, with the poorest performance observed in children on dialysis, the magnitude and domain-specific patterns of effect are not clearly defined in the existing literature. Well conducted longitudinal studies assessing multiple cognitive domains as children progress through different CKD stages are needed to better elucidate the association between reduced kidney function and neurocognitive function. The authors would like to specially thank Dr. Tonya Kara who, although no longer with us, continues to inspire with her courageous character and contributions to things larger than ourselves. We also thank Philip Masson for his assistance in the development of search strategies. A.v.Z. is supported by a National Health and Medical Research Council (NHMRC) postgraduate scholarship APP1115259. N.N. is partially supported by NHMRC Career Development fellowship 1067066. A.T.-P. is partially supported by NHMRC Program grant BeatCKD APP1092957. See related Patient Voice, “Responsive Designed Interventions Are Needed to Support Positive Outcomes of Children and Adolescents with CKD,” on pages 357–358. This article contains supplemental material online at http://cjasn.asnjournals.org/lookup/suppl/doi:10.2215/CJN.09650917/-/DCSupplemental.